The ground level includes the Banquet Room and Kitchen area. 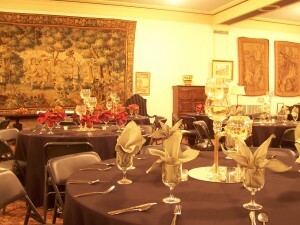 The Banquet Room is regularly used to serve groups as large as 600 persons. 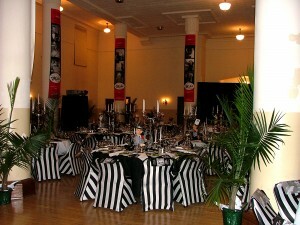 The Banquet Room has a thirty-foot ceiling and more than 8,200 square feet of space. Twelve-foot West-facing windows provide natural lighting. The first floor is accessed from the bronze Main Doors on the south end of the building. The main doors open into the foyer, which is finished with rough Italian marble walls and elaborate decoration. The First Floor includes offices and a large coat room. The Second Floor includes the Main Lounge, organizational offices and the Consistory Library. The Lounge is an expansive space – more than 4600 square feet – that covers half the floor. The Lounge includes an ornamental fireplace, antique furniture, assorted artwork and the Aubusson Tapestry, a 17th Century French tapestry. 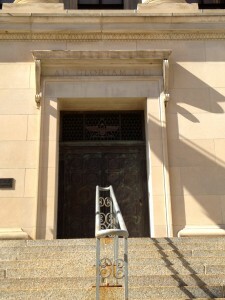 The Library is 24 feet by 48 feet in dimension and is located on the east side of the second floor of the building. The room includes book cases on three walls and has a cork parquet floor. 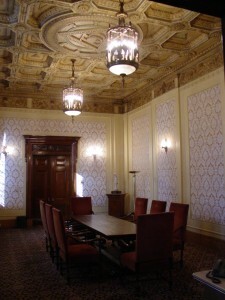 Adjoining the main lounge are organizational offices, a coat room and an ornate meeting room known as the Conference Room. The Conference Room is the most finely appointed room in the building – with embossed ceiling, chandeliers and silk wall covering. The room includes a large conference table with eight high back chairs. 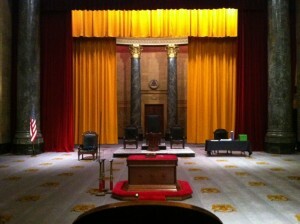 The showplace of the Des Moines Scottish Rite building is the Third Floor Auditorium. 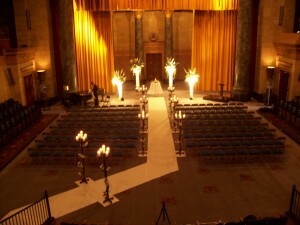 The Auditorium is designed to seat over 1000 persons and includes extensive sound and lighting. The ceiling above Auditorium, over 40 feet high, has intricate symbolic inlays and original hanging light fixtures. The northwest corner of the Auditorium has the Choir Loft and pipe organ. Outside the auditorium, the Third Floor Lobby has stairway and elevator access. Adjoining the Lobby are three smaller break-out rooms. One of the break-out spaces is known as the George Washington Room – which includes a variety of items related to the First President, including artwork and writings. One of the treasures of the Des Moines Scottish Rite is a letter penned by George Washington, who was a member of the Masonic fraternity. Access for persons with disabilities is available for the public spaces in the building from the south-east corner entrance to the Building. View more pictures on our Facebook and Pinterest pages.